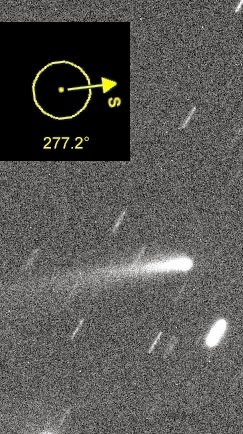 209P/LINEAR is a periodic comet discovered by the Lincoln Laboratory Near-Earth Asteroid Research (LINEAR) survey on five images taken on 2004, February 3.40 (discovery magnitude ~18.1). Reported by LINEAR as an apparent asteroidal object, it has been found to show a narrow 1'.1 tail in p.a. 274 deg (slightly expanding toward the end) on CCD images obtained by R. H. McNaught with the 1.0-m f/8 reflector at Siding Spring on Mar. 30.8 UT. This comet has been assigned the permanent designation 209P on 2008, December 12 (previous designation were P/2008 X2 (LINEAR) = P/2004 CB). We performed follow-up measurements of this object on 2014, April 14.95 with the 2.0-m f/10.0 Ritchey-Chretien + CCD telescope of La Palma-Liverpool (J13 MPC code). You can see our image below with the comet a about magnitude ~17. (click on it for a bigger version). According to a prediction by E. Lyytinen and P. Jenniskens, comet 209P/LINEAR will possibly cause a big meteor shower on May 24, 2014. On May 29, 2014 this comet will pass just 0.055 AU from Earth or about ~8 million km (while the perihelion, i.e. closest approach to the Sun, will be on May 6, 2014) making it one of the closest comet approaches in history. Comet 209P/LINEAR will be at magnitude ~10 around the time of the shower. The main source of activity should become 1898-1919 trails, however some meteors could be produced by the earlier trails of the comet, down to 1763 trail, which is the oldest computed trail, and even earlier. The computed time of maximum activity is May 24, 2014, at 7:21 UT, theoretical radiant is RA=122.8, Dec=+79.0 (in the constellation Camelopardalis). According to the image below (showing the hemisphere of Earth that will be facing the incoming dust particles from Comet 209P/LINEAR when the activity peaks on May 24, 2014), skywatchers in southern Canada and the continental U.S. will be especially well positioned to watch the sky show. A recent paper by Q. Ye and P. A. Wiegert reanalyzes the optical observations of 209P/LINEAR obtained during its 2009 apparition, They found that the comet is relatively depleted in dust production, with Afρ at 1 cm level within eight months around its perihelion. This feature suggested that this comet may be currently transitioning from typical comet to a dormant comet. Given that the comet is relatively depleted in dust production they concluded that a meteor storm may be unlikely. We are analyzing our recent observation to calculate the Afρ parameter and we'll post the results here as soon as they are available. 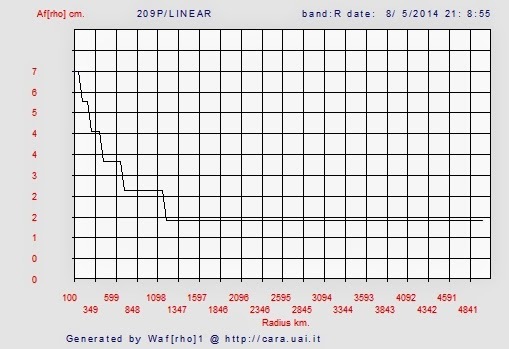 Below you can see the graph showing our Afρ results obtained analyzing our follow-up image of 08 May 2014. The Afρ parameter is ~2 cm, a very low value that is in line with the results outlined in the Ye and Wiegert's paper with the comet that seems at present relatively depleted in dust production (click on the image for a bigger version). 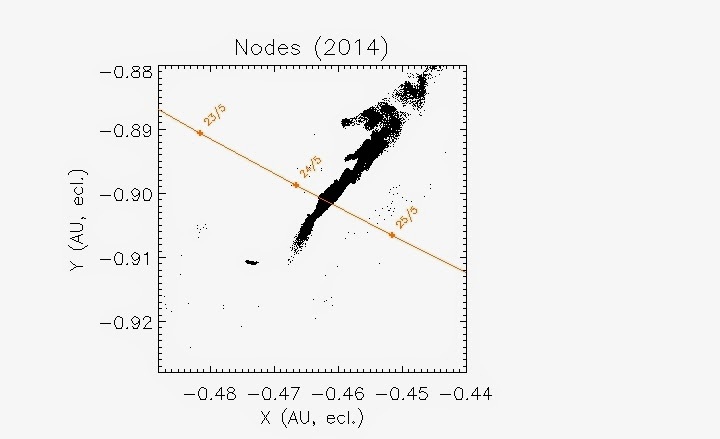 The image below is showing the tail's position of comet 209P in relation to the Sun position (indicated by the S on the arrow in the yellow circle). Cbet nr. 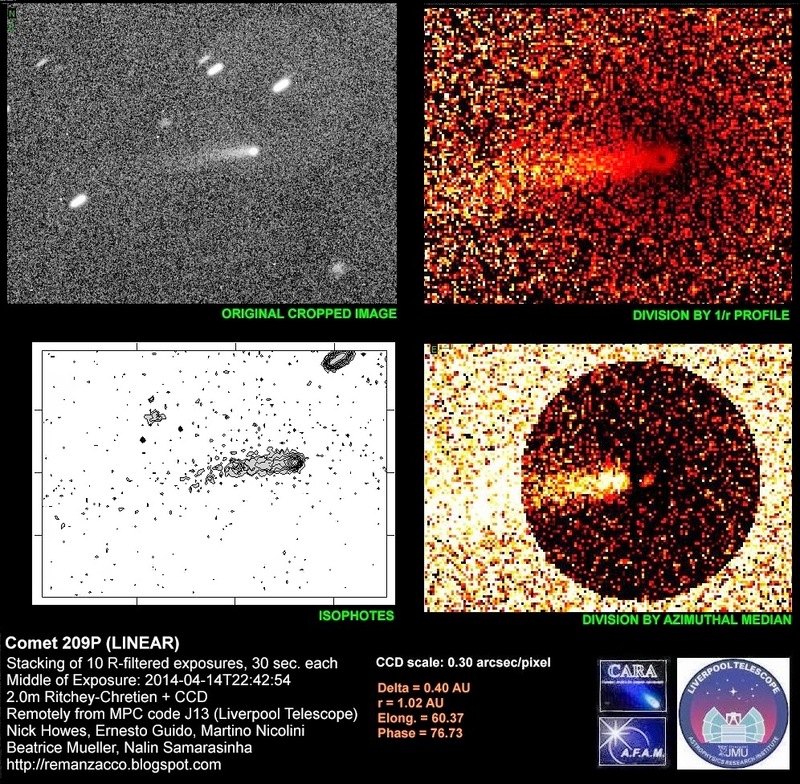 3840, issued on 2014, April 01, announces the discovery of a comet (~ magnitude 18.6) on CCD images taken on 2014, March 29.4 by R. E. Hill with the Catalina Sky Survey's 0.68-m Schmidt telescope. The new comet has been designated C/2014 F1 (HILL). We performed follow-up measurements of this object, while it was still on the neocp. Stacking of 10 unfiltered exposures, 60-sec each, obtained remotely on 2014, March 30.4 from H06 (iTelescope network - New Mexico) through a 0.50-m f/6.8 astrograph + CCD + f/4.5 focal reducer, shows that this object is a comet: coma about 5" in diameter elongated toward PA 215. Our confirmation image (click on it for a bigger version).